Nothing to do with model railways this, but here are a couple of pictures of the timber that landed on the beaches near us recently. It came from the ship the "Ice Prince" which sank off Dorset, a hundred miles or so West of here, and came up the channel on the tide. If the pictures look impressive, remember they were taken a week after the timber was washed ashore, so the clear up operation had already moved most of it up the beach. Now you could make a lot of baseboards out of that timber, if it wasn't for the fact that it has been in the sea for a week, and also the threat of a £2000 fine for anyone taking any! Back to the model, progress on the station has been good with me finding time on a few evenings recently, though I have yet to make the roof. I will have more pictures and another update soon! Here's a picture of the station and goods shed under construction. The brick wall runs down the centre, the posts at the front will support an overall roof, the wooden goods-shed is behind. Since this picture was taken I have cut doorways into the wall, and a gable-end of the station office for the rear left corner. Construction is from Plasticard with Wills and Slaters sheets, and Plastruct square-section for the wooden supports. The picture also shows my portable workbench! 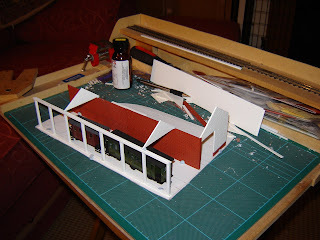 I constructed this to allow me to do my model making in the evenings, in front of the telly or on the dining room table. It lives in the cupboard that the railway sits on, along with my toolbox, so is very convenient. The workbench consists of an A3 cutting mat on an MDF base, with a raised shelf for tracks in both 00 and 009 (unpowered but useful for coupling height setup), on the left is a mini-vice and a V-shaped piece of wood for saw cutting. There is space for oddments, materials, part-constructed models etc. Well some progress has been made over Christmas. Holes had been cut in the plywood board before Christmas for the point motor operating rods, and also the uncoupling magnets. The board was then covered in 1/16 inch cork sheet, and the holes then cut through. The track was then assembled with the 7 points and the tracks that join them, this assembly of track has now been glued to the board. I also sprinkled ballast over the track while the glue was wet to get the first layer of ballast down. So all the points are now laid, and the sidings are cut to length, however I have stopped there as it struck me that some of the sidings need to run into or around buildings, so it would be best to have the buildings in place before completing the track laying. 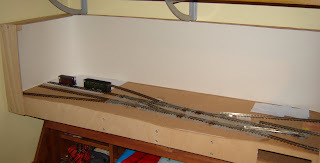 Also the entry track needs to be laid from the first point to the fiddle-yard cassette lead-in in one piece, so I will have to do that with the fiddle yard present. Anyway I have since made a start on the station building and goods shed, this is inspired by the one at Wantage and includes a roof over the platform. The photo above shows the progress so far (the facia board has been removed), the ballasted track is laid the rest is just placed down for now. The white area of the board at the rear left is the card base for the station and goods-shed, this sits in a cut-out area of the cork so the track is the same level, but will make constructing the building easier. Also visible in the photo is the backscene. I cut triangles of foam-core board with an internal radius and stuck them into the corners of the layout, then cut a length of lining wallpaper (1000 grade) and stuck it to the back and ends of the layout and the inside of the foam-core fillets to make a continuous, smooth backscene around the layout. A second layer of lining paper was then stuck to the first, both layers using a spray-adhesive made by Bostick. The backscene is over 5 feet (close to 1.6 meters) long and 9 inches (23cm) high, now all it needs is to be painted sky colour. I have heard this can be done quite easily using household emulsion paint, so I will give it a go, unless I find a suitable commercial sky-paper first! Any suggestions let me know.